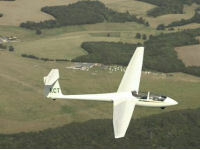 Product review: Gliding over Kent – by anon, 13 Aug 15 5/5 Excellent "The operator was very easy to contact.,. and very efficient, arranging the date and time that I requested. As soon as I arrived I was taken to meet my instructor. All visitor facilities were as expected and members of my family were made very welcome. Staff put me at my ease Fantastic afternoon would do it again.Not rushed at all, very pleasent afternoon. " You will receive a safety briefing, explanation of the aircraft and its controls before being strapped into the cockpit. You will then enjoying the view as you are towed by a tug plane up to a height of 2'000 ft before being released and soaring for approximately 15 minutes. Your instructor will demonstrate the controls before letting you have a go at flying the glider yourself. Very easy - just a phone call to the flying club to set a date. Was able to arrange one within a couple of weeks of giving the present which was great. Don't have a sat nav but airfield was clearly indicated on the map and was easy to find even though it's off the beaten track. Staff very friendly and helpful. Small delay to the time agreed as the first tow plane had a fault and they had to ready a second plane at short notice. However staff kept us fully informed as to the reason and were very competent and professional. Club members were safety conscious at all times and gave my husband a very clear briefing before the gliding flight. Weather was perfect - lots of thermals rising and clear views over the beautiful Kent countryside. Pilot was very welcoming and friendly. My husband enjoyed every minute of it and would have stayed in the air all day if possible. Said it was the perfect birthday present!Club has a small cafe and toilet facilities. We were free to take as many photos as we wanted and were welcome to stay and get a cup of coffee. The operator was very easy to contact.,. and very efficient, arranging the date and time that I requested. As soon as I arrived I was taken to meet my instructor. All visitor facilities were as expected and members of my family were made very welcome. Staff put me at my ease Fantastic afternoon would do it again.Not rushed at all, very pleasent afternoon.